I just realized that two weeks from today is Thanksgiving Day, one of my most favorite of holidays. Usually I am conscious of it well ahead of time, but I've let myself be distracted by so much this year, and it's time to make a concerted effort to get back on track. So even though I can *easily* think of approximately 50 things right off the top of my head to complain or be upset about, I want to concentrate instead of thankfulness. 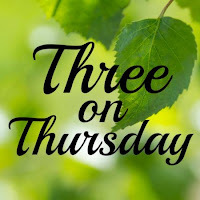 Since today is Three on Thursday, it's a good time to make note. So, here are three things that are making me thankful. 1. I am extremely grateful to live in an area where there are truly amazing teaching hospitals, that allow me to receive top-notch medical care. My most recent trip to the emergency room at the Hospital of the University of Pennsylvania (aka HUP) gave me an up-close-and-personal look at how hard the doctors, nurses, orderlies, and even the building people work on a regular basis. Though I didn't want to be there and was upset, my care and the kindness of the staff left nothing to be desired. My orthopedic surgeon is also stellar and everyone who works with her has been more than kind and helpful. I know it's all of their jobs to be so, but I also know every day is not a good day, but they always put their best face forward. God bless them all. 3. I am thankful that I can make myself see the good things in my life. Some days it feels like the universe and my body are busy working against me, and I get really overwhelmed by it all. Then I tell myself to think of the good things. Even if I don't immediately feel better, I know the fact that I can do this exercise means I'll be OK. I hope all of you are happily looking forward to Thanksgiving as well, and that those of you who have already celebrated (hello northern friends! ), or who do not observe that holiday are still finding some good things to make life worthwhile. Take care. #3 --- I think I probably fall into that category. It sounds hokey to say "look on the sunny side" because some days there isn't one, but at least I try. Hope OT goes well and that you and the super-hero cast can part ways. I am happy for your beginning therapy! And, I am with you about a refocus on gratitude - it is a very good thing! Physical/Occupational Therapy is truly helpful. I'm a big believer. I know you will continue to be thankful for that. All good things to be thankful for! And I hope you have a spectacular Thanksgiving too! You deserve it! It's been proven that a positive attitude speeds healing and rehabilitation. Sending positive vibes your way. It's wonderful to hear about the excellent care you've received from almost everyone you've encountered. Even to me it seems like you broke your wrist ages ago, so I'm sure it really feels like forever ago to you, with all the attendant pain, troubles, and casts. Congratulations on focusing on the good things; that is an accomplishment! I'm sorry to hear therapy is so painful for you. I've heard this from so many others since I am at the age where almost everyone I know is having something replaced. Here's to hoping it won't last long and the results will be just what the doctor ordered.